As of Oct.3rd, despite the impact of tropical storm Neglae, the number of visitors received in Nanshan Culture Tourism Zone hit 15,200, the same level over the same period last year, reports hinews.cn. 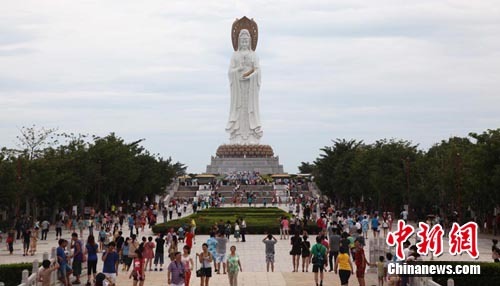 During the holiday, the number of tourists joining package tours in Sanya is increasing. On Monday alone, 1,700 self-drive vehicles swarmed into Nanshan Cultural Tourism Zone. Most of them drove from southwest of cities like Guangxi, Chongqing and Guangzhou. Tourists flocked to Yalong Bay Tropical Rainforest Park reached more than 10,000 person times and Yanoda Rainforest Park also embraced its self-driving peak with daily visitors increasing 43% to 5,000 on Monday alone. Affected by the storm, self-driving tours in the next two days will be greatly reduced and city dwellers planning for island travel will be also influenced.